February 10, 2012 marks the third anniversary of the first ever collision between two intact satellites in orbit. The collision, which occurred between Iridium 33 and Cosmos 2251 over Siberia, stunned the aerospace community and brought the realization that even though the heavens were vast, the orbital planes above the Earth are finite and there are few if any rules of the road when the traffic within that finite space becomes congested. After the initial astonishment from the collision, the finger-pointing between the operators of the satellites in the United States and the Russian Federation began. The Russian Federation was quick to point out that Cosmos 2251 was a derelict satellite incapable of maneuvering, and it correctly asserted that it did not have an obligation under international law to dispose of Cosmos 2251 after it became derelict. The Russian Federation then placed fault for the incident on Iridium LLC’s failure to maneuver their spacecraft so as to avoid the collision. For its part Iridium LLC made the contention that it did not have any obligation to avoid the collision even if was aware that such a collision would occur. In its wake the question was begged whether the second scenario of the Liability Convention would be invoked to recover compensation for the loss of either satellite. Under the second scenario of the Liability Convention, which has never been tested, a fault liability standard applies whereby a State will be considered liable only if it can be shown that the damage caused was due to the fault of the State or States responsible for the launch of the space object. This theory of liability is similar to the maritime law standard of comparative fault, whereby the percentage of fault and thus liability will be apportioned according to the negligence of each party involved to the aggregate liability. Once the percentage of fault for each party is determined, the total amount of damages for the incident will be determined, and from that total each party will be apportioned its damages based on its percentage of fault. However, the conflicting information leading up to the crash coupled with the lack of tracking data for that orbital section of outer space gave neither party sufficient evidence to meet the fault standard set by the second scenario. 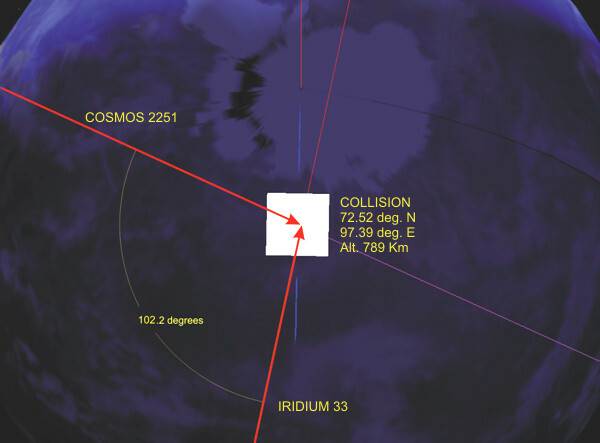 GPS simulation of the Iridium 33/Cosmos 2251 collision (Credits:Varol Okan, Genti Ismaili). Secondly, the incident helped to foster cooperation among the space-faring nations in addressing the issue. Most notably, the United States and the Russian Federation opened a dialogue to discuss the issue and take measures to prevent similar incidents in the future. Probably the best example of this is the agreement the Russian Federation has with the United States via U.S. STRATCOM’s Joint Space Operations Center (JSpOC). Under this agreement JSpOC shares orbital element data it obtains with the Russian Federation as well as other governmental and non-governmental organizations. This relationship was exemplified when the JSpOC provided the Russian Federal Space Agency with orbital element and predictive data on its marooned probe Phobos-Grunt. It is noteworthy that the arrangement JSpOC currently has with the Russian Federation and other countries was in the works prior to the Iridium/Cosmos collision; however, the collision epitomized the need for this cooperation and certainly influenced its final form. In spite of these beneficial outcomes, more still needs to be accomplished. The issue of space debris and space situational awareness is one that needs to move forward in terms of understanding what is happening in the outer space environment. While many of the space-faring nations have implemented guidelines to lessen the accumulation of space debris, there still remains a clear and present issue with space debris already in orbit. Unfortunately, politics, legalities and economics make the issue difficult to address. However, if we remember anything on this anniversary of the collision between Iridium 33 and Cosmos 2251, it is that the problem cannot be wished away and ignoring it will only make certain that another, perhaps more serious, incident will occur in the future. If a requirement to de-orbit satellites reaching the end of their service lives is implemented, will we just be waiting for an incoming chunk to clock out a building on the ground? I can already hear the arguments about how vast Siberia and the Pacific Ocean are in comparison to populated areas. But then we wonder if we’re doing stuff in space perhaps better done on the ground. The geosynchronous satellite which provides episcopal telecommunications coverage can’t be repaired and usually doesn’t last as long as undersea cables and comparable microwave links on towers do. Apparent cost savings reflect the government space launch subsidy. We’ve seen wholesale abandonment of the latter for the former; even a call from Kansas City to St. Louis may go via satellite. Little thought touches on the huge quantities of non-renewable fossil fuels needed to achieve orbit in an endless growth mindset where energy efficiency ranks lower on priority lists than it should. There are certainly things we can do only from space. Is it wise, however, to put all our tech eggs in the basket up there?